The cabinet print above has been 'cut to size'. Only part of the word Turnbull and the address 'Glasgow' can be seen. The photograph is probably from the studio of Turnbull & Sons. 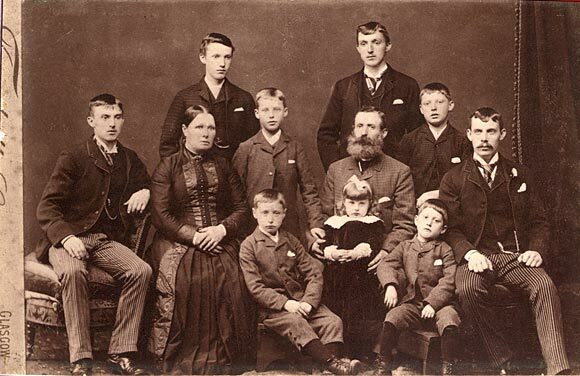 - The photograph was taken around 1890 in Glasgow. - The parents in the picture are Richard Campbell and Catherine Jaffrey. - The girl sitting on her father's knee is his grandmother. - A person has been removed from centre back, between the two boys. Laurie tells me that he believes this was done by "cutting out a bit of the background and moving it around during the printing". How common was it in the 1890s (a century before the days of digital imaging) for photographs to be changed in this way?